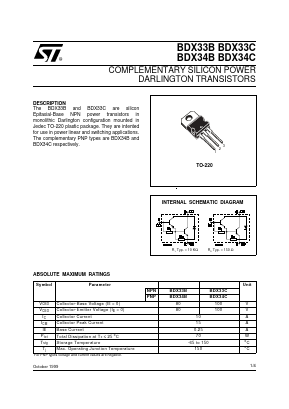 The BDX33B and BDX33C are silicon Epitaxial-Base NPN power transistors in monolithic Darlington configuration mounted in Jedec TO-220 plastic package. They are intented for use in power linear and switching applications. The complementary PNP types are BDX34B and BDX34C respectively.